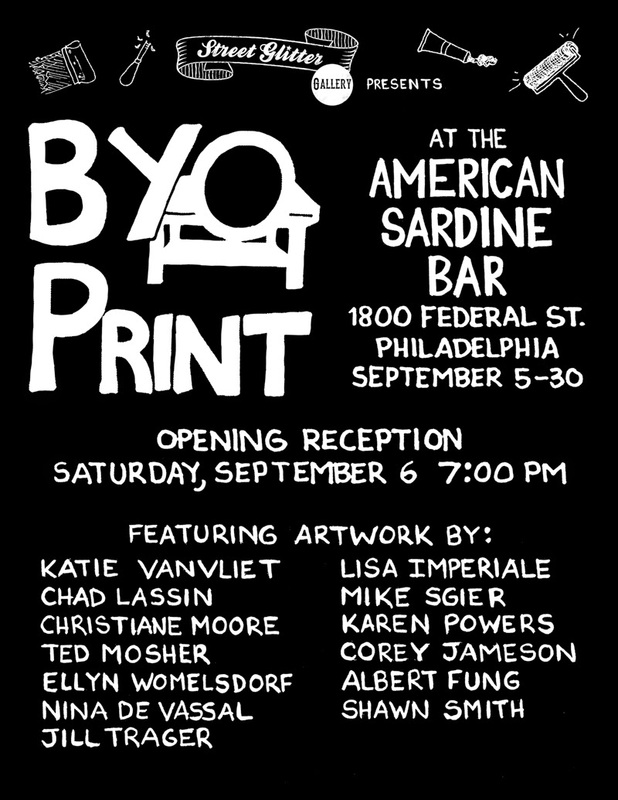 BYO Print, with the help of Street Glitter Gallery, is taking over The American Sardine Bar in South Philly for the month of September. We are excited to introduce you to a few new members and show you what we've been working on this summer. Come join us for our Opening Reception on Saturday, September 6th! Visit us at our space this weekend for POST to meet new members of the studio, learn about printmaking, and see what members are currently working on. Revel in the glory of the powerful rays of the sun with printmakers from BYO Print, and make traditional-style cyanotype prints, also known as sun prints. We provide all the materials you'll need to make a unique print to take home. You can also BYO objects to use that are opaque and flattish. Feathers, pressed flowers, stencils are great for this. BYO Print is currently seeking one or two new members. Monthly membership gets you 24/7 access to the studio, shared supplies, on-site storage, annual group exhibitions and more. Printmaking proficiency a must, community-minded attitude a bonus. Email us for a tour and more information at byostudio.philly@gmail.com.